Valentine’s Day menus at Lokanta are always made for two. 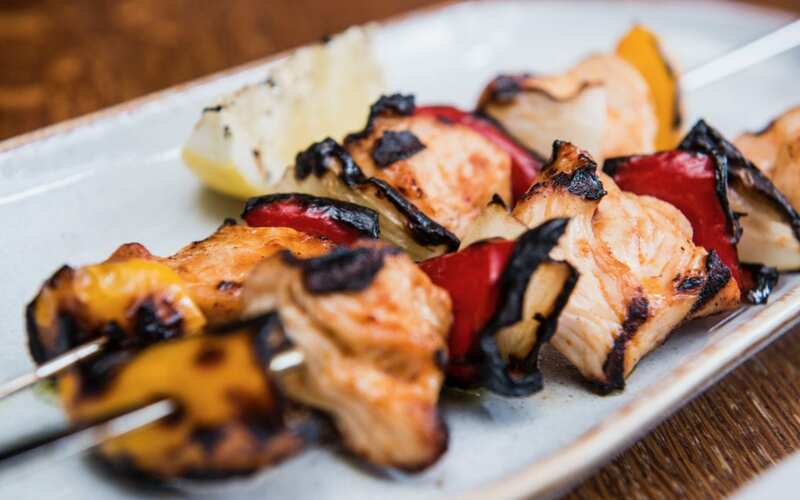 Our Turkish Mediterranean menu is perfect for sharing, whatever the occasion. Meze dishes are the ideal social food. The variety of tastes is great for groups and parties but we think just as good on a small scale, when two is all the company you need. We hope you will enjoy eating out this Valentine’s Day with us and that Lokanta will win a special place in your heart. We have three different Valentine’s Day Menus which as always we have priced per couple. The first is Meze Seventh Heaven; a free choice of seven meze dishes from our main menu served with warm bread. This is followed by our Valentine’s sharing dessert plate of baklava, chocolate brownie and our Turkish delight cheesecake. Next we have Valentine’s Meze and Grill which starts with a selection of hot and cold vegetarian meze to share and then offers you a main course each before sharing again for dessert. Main course options here are our grilled sea bass, a mixed grill, a sirloin steak and chips or a vegetarian halloumi and vegetable stack. The dessert is our valentine’s sharing plate as above. Finally we have our Sultan’s Delight. Its sharing all the way with this one but definitely no shortage of food. The menu starts with a selection of hot meze to share. The sharing plate includes Lokanta favourites minced beef parcels and courgette fritters. This is followed by our bestselling Sultan’s mixed grill for two which has everything from chicken to spicy beef sausage. It is served with our buttery rice and sautéed potatoes, plus grilled tomato and pepper and a little pot of our red pepper barbecue sauce. Our valentine’s sharing plate offers a sweet ending. The couple who eats together we hope stays together! Enjoy the shared experience at Lokanta this Valentine’s Day.